Did you know Disney park employees (cast members) have special code names they use over their radios when a situation arises? When someone tries to spread the ashes of their dead loved one on the Haunted Mansion Ride (yes, people actually try to do this), they use the words "White Powder." The ride is immediately closed and guests are evacuated. Then cast members in protective clothing vacuum up the departed’s ashes. If you hear the words "Code V" come across the radio, it means a guest has vomited and it needs to be cleaned up. It is also sometimes called a "Protein Spill." "Code 101" means a ride or attraction has a mechanical failure and must be closed. "Code 102" means the ride is ready to be reopened. "Signal 70" means a child has been separated from his or her parent and is lost somewhere in the park. "Signal 25" means there is a fire. "The Kiss Goodnight" means a guest is lingering in the park after closing has been announced and needs to be escorted out. "Code Winnie" means someone has peed in a pool area. Emergency first responders are called "Alpha Unit." There's one other secret code I want to tell you about. It's the code "Treasured Guest." This term is used to alert other employees about a guest who is exhibiting unruly or rude behavior. Disney employees are known for their excellence customer service training and skills. I think this is reflected so well in these words they use to describe a troublesome customer. In children's ministry, we often encounter "Treasured Guests" don't we? A child who is refusing to participate and is sitting in the corner alone. A parent who is ticked off because they forgot their security tag. A child who continuously disrupts the class. A baby who won't stop crying. A toddler who bites another child. An elementary child who hits another child. A pre-teen who says unkind words to another pre-teen and hurts their feelings. A grandparent who is upset that their grandchild didn't get picked to be the lead role in the church Christmas play. The family who shows up after you've closed check-in and demands to be accommodated. The child who has major behavioral issues. How do we see the kids and families who put us in these situations? As a bother? As a pain to deal with? As a disruption? As a bad person? As a problem that has to be endured? Let's be honest. That's normally our first reaction, isn't it? But what if we started seeing these kids, parents and families as treasured guests? What if we saw them as Jesus sees them? What if we treated them as treasured guests? When everyone else saw Zaccheus as a selfish thief, Jesus saw him as a treasured guest he wanted to dine with and transform into an honest man who loved God. When everyone else saw Peter as a hot-headed trouble-maker who denied the Savior, Jesus saw him as a disciple with great potential. When everyone else saw a Samaritan woman who had failed at multiple marriage relationships, Jesus saw a lady who longed for a true relationship with God. When everyone else saw just a boy with a lunch, Jesus saw the potential for a miracle. When everyone else saw a demon-possessed maniac living among the tombs, Jesus saw a man who could be forgiven and made whole. When everyone else saw diseased-ridden lepers, Jesus saw people who could be healed and receive a fresh start. When everyone else saw a dead man named Lazarus, Jesus saw resurrection and life. When everyone else saw cruel, sadistic soldiers, Jesus saw people who did not understand what they were doing and needed God's forgiveness. When everyone else saw a sheep that had wandered from the flock and gotten lost in the wilderness...a trouble-making kind of sheep...Jesus saw a lost sheep that needed seeking and saving. A sheep that was worth the shepherd giving his life for. May God give us eyes to see people as He sees them. Treasured guests. May He help us see beyond the behavior issues, the rudeness, the anger, the disruption...and see people for the treasure they are. Kids and families that are diamonds in the rough. When we begin to see people as treasured guests, no matter their issues, we will minister to them with love, respect and compassion. We will be able to see below the surface issues and see who they can become through God's grace. 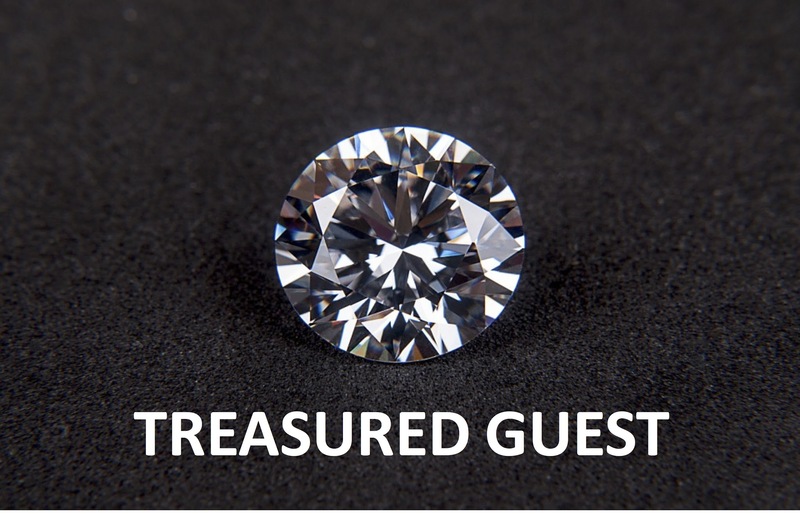 So...this week...when a parent causes a stink...whisper the words "Treasured Guest." When a child disrupts the entire class...whisper the words "Treasured Guest." When a preschooler gets mad and tears up the craft you've placed in front of them...whisper the words "Treasured Guest." When you're about to lose it because of the baby who is crying on and on in the nursery...whisper the words "Treasured Guest." When a parent is 30 minutes late picking up their child and you find out they were talking with friends the entire time...whisper the words "Treasured Guest." When a pre-teen says mean words...whisper the words "Treasured Guest." There are times when all of us need grace. There are times when we all need someone to look beyond our faults and shortcomings and still see us as a treasured guest. Let's do the same for others. If we do, it will be life-changing for the kids and families in our ministries. You can get more great ideas for your children's ministry in the best-selling book "If Disney Ran Your Children's Ministry." Order your copy now. I love this! Our 'Treasured Guests' probably need that special treatment more than our regulars. Thanks for the reminder. Wow... this is a big part of the culture we want to create in Children's Ministry. I will be adding this to our training for sure!